Make this Valentine’s Day super special with a limo ride that trumps all! There is a wide selection of stylish vehicles available that are very affordable and range from stretch limos to luxury sedans. Your perfect limo ride awaits right at your fingertips for early booking. Both you and your sweetheart can be transported to your favorite destination in style as you bask in the comfort and luxury of a Valentine’s Day limo ride. Depending on your Valentine’s Day needs, several options can be provided appropriate to the extent of your excursion. Party Bus – Have a blast with your friends on the big day with a “Party Bus Limo”. Tour the town as you party the night away with ample room and great accommodations. Stretch Limo – Release your inner celebrity in a “Stretch Limo”. You will get that “power couple” feel when you arrive at your favorite destination for the evening. Just when you thought a luxury limo was only for the “rich and famous”, you find that stretch limos are surprisingly affordable. Stretch SUV – If you plan on doing it big, nothing beats a “Stretch SUV”, which may accommodate 4 to 6 couples. Ride to a great restaurant or party spot in a stylish vehicle and be the envy of all. Luxury Sedan – Give all of your attention to each other in the comfort and luxurious surroundings of a “Luxury Sedan”. The amenities of this vehicle are perfect when it’s just you two. Let someone else do the driving for a change. SUV – An SUV is the best ride solution for at least two couples. It is a contemporary option that offers a quiet intimate ride. Premium Sedan – If you want the ultimate in luxury, a “Premium Sedan” is the ride for you. For luxury transportation and amenities, only the best will do. You won’t regret hiring a limousine provider that offers courteous, professional services for you on Valentine’s Day. Drivers will collect you from wherever you are and give you safe transport to wherever you like. Spotless interiors and exteriors will assure you a premium ride that caters to the personal timing of your evening. Prices can be customized to your affordability and the availability of the limo of your choice. Some limo services offer packages that are inclusive of sightseeing, tours, concerts and shopping. The great thing about limo services on Valentine’s Day is that they cater to way you have planned and scheduled your evening. 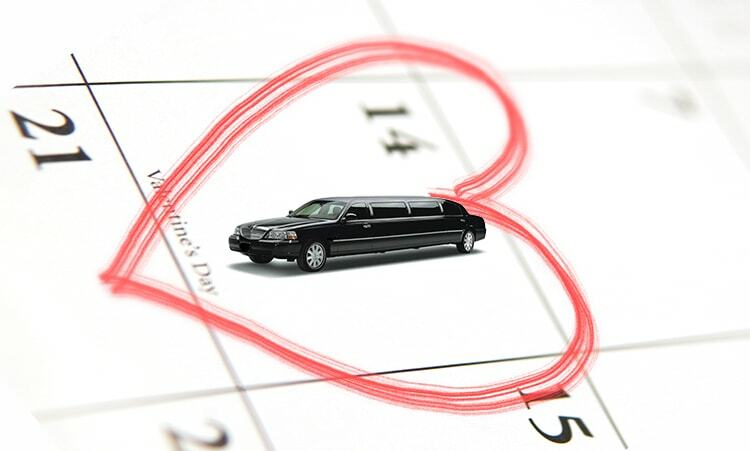 On a popular day like Valentine’s Day, it is imperative to book your limo early. This way you are assured to get the limo of you choice and the package that best suits your needs for the day or evening. The best time frame to book is 3-4 weeks ahead to be sure that your rental is available on that day and for the times you’ve planned for service. When you plan for a large group, like 12 or more, you want to know that the more exotic vehicles are available to accommodate everyone in a comfortable manner. Motorcoaches are a great option, as they offer such amenities as, wrap-around seating. In any instance, make sure you provide the the limo service with as much detail as possible about your Valentine’s Day plans. So you’ve planned your Valentine’s evening with no stones unturned. You’ve made your list and checked it several times, making sure that the evening goes as you have perfectly planned it. While that takes a load off the planning phase, it is important to know that your limo booking is with a legitimate limo company. Make sure that they are properly licensed, insured and registered. If the limo company has difficulty in presenting their credentials upon your request, you may want to choose another limo rental company. Don’t let the excitement of the event overshadow your need to be assured of legitimate services for the money.